Easy steps for how to grow broccoli in home vegetable gardens. How to plant and care for broccoli plants in your garden. Many gardeners seem to be a bit intimidated about growing broccoli in their gardens. There is no need to fear, as raising broccoli plants is quite simple with just a few basics to keep in mind. Broccoli is a very recognizable vegetable with its thick stalk and broad leaves. This nutritious and delicious veggie often gets a bad review from kids and even former President Bush! Admittedly, it may be an acquired taste for some people but it is one of many gardener's favorites for growing in the vegetable garden and eating! Let's discover the incredibly easy steps of how to grow broccoli successfully for those finer connoisseurs of good taste. This cold season plant requires a minimum soil temperature of 40 degrees F for planting. However, the ideal ground temperature is 85 degrees F. Broccoli grows in bunches of tiny bud clusters called heads. The head size depends on the type such as small, large, or single. The cool season vegetable is a member of the cole family. Although, it may be difficult to get finicky eaters to try broccoli, it is the easiest member of its own botanical family to grow. For USDA climate zones 3-4, plant the vegetable in May. Planting time in climate zone 5 is April -May. Plant broccoli in climate zone 6 in months March-April. In zones 7-8 planting time is February-April. For zones 9-10 broccoli is planted in July-October. 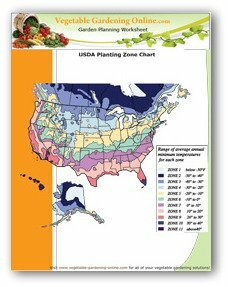 Download our free zone chart and planting guide to determine your planting and growing zone. Choose a location that is not exposed to more than 2 hours a day of direct sunshine. Test the vegetable garden soil for for medium levels of nitrogen and high amounts of both potassium and phosphorous. A proper acid/alkaline balance is necessary as well as maintaining a 6.0-6.8 pH level. Supplement soil with compost. Rotate site location annually to prevent depleting nitrogen in the soil. Start indoors 6 weeks prior to last expected frost. Transplant broccoli seedlings in 3 weeks after hardening for 5 days. Plant broccoli seeds at a depth of ½ inch. Sow broccoli seeds 2 inches apart. Separate broccoli rows 24-30 inches. Thin plants to 14-18 inches apart. Allow 2-4 plants for each family member. If you are planning to have extra for the freezer, plant 6-8 plants per family member. Give green a chance! It takes an average 10 to 15 days for broccoli seed to germinate. 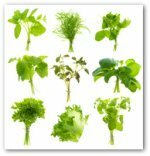 Herbs, beets, potatoes, celery, and onions make good companion plants. Strawberries, pole beans, or tomatoes are not so nice neighbors of broccoli and should be avoided. Water to maintain constant soil moisture, not overly dry or too damp. Watering plants from overhead is not recommended. 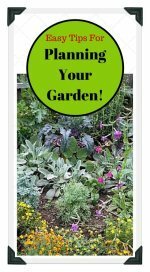 Mulch around plants to deter weeds from growing. Broccoli is generally ready for harvest in 85 days for transplants. Harvesting from seed is typically 70-100 days. When fully grown, the vegetable plants are 2 to 3 feet high. It is subject to bolting in warm temperatures and as hours of sunlight lengthen. Heads can be harvested when buds are still green and tight by cutting the main stem below the head. Leave the secondary shoots for smaller broccoli heads to develop. 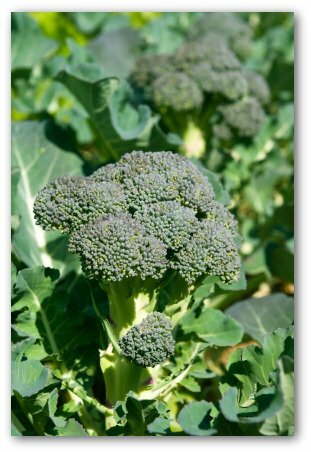 After harvesting, soak broccoli heads for several minutes in warm water, salt, and vinegar to remove pests. Dry completely before refrigerating. Broccoli can be stored in refrigerator's vegetable bin for a couple of weeks. After blanching for a minute in boiling water, the vegetable may be preserved frozen for several months. By following the simple guidelines of how to grow broccoli, your family is sure to give you rave reviews. 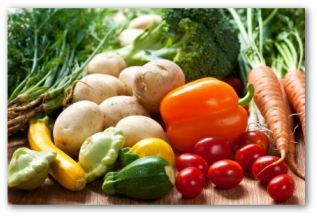 Involve your children in your gardening endeavors, and instead of those previously turned up noses when you serve vegetables, the kids will want to try all the fresh veggies they helped produce. 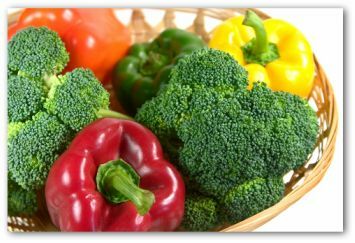 Add the tasty fresh vegetable to colorful stir fry and you will have your children eating out of the palm of your hand! Figuratively speaking of course!